The Northern Ireland Housing Executive has insisted that it is “fully compliant with all fire safety regulations” and takes the safety of residents “extremely seriously”. The organisation gave the assurance in response to concerns about the fire alarm system in Coolmoyne House, Seymour Hill following a blaze at the multi-storey flats on Wednesday evening. More than 50 firefighters were tasked to the incident and four residents had to be treated for the effects of smoke inhalation after a fire broke out in a ninth floor flat. According to the Housing Executive, three residents whose flats were affected had to spend the night in a nearby hotel. Following the incident, local DUP Councillor Jonathan Craig said residents had serious concerns about the alarm system in the high-rise block. Responding to concerns about the alarm system, a spokesperson for the Housing Executive said: “The Housing Executive wants to reassure residents that their safety is taken extremely seriously. We work closely with the Fire Service to ensure we remain fully compliant with all fire safety regulations, have robust fire safety regimes and carry our regular inspections in all of our high rise buildings. 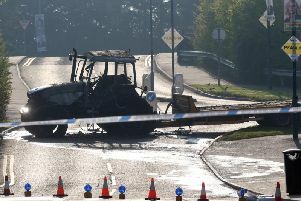 The spokesperson continued: “The cause of the fire is under investigation by the NIFRS. We will be fully co-operating with them. “Residents seeking high rise fire safety advice can find it on our website - www.nihe.gov.uk/highrise_buildings or contact your local office. The NIHE manages 33 high-rise buildings across Northern Ireland, with approximately 1,900 properties.